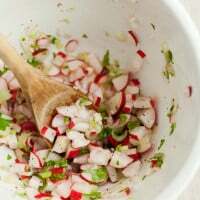 Radish Salsa with Scallions | Naturally.Radish Salsa with Scallions | Naturally. Cut the radishes into thin slices using a sharp knife or mandoline. Place the ingredients in a bowl and toss until well combined. Allow to sit for 20 minutes before serving.